This is Clare Mackintosh doing what she does best: a tense story with many twists and turns so you never know who to trust. 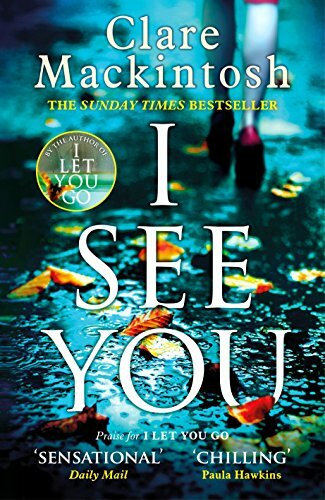 She did it so well in I Let You Go and I See You is just as gripping a read. Zoe Walker travels the tube everyday, taking the same routes at the same times, even down to sitting in the same place and standing at the same place on the platform. How many of us have such a routine? A lot, I would imagine. One day she sees her photo in the London Gazette accompanied by a telephone number and a website address, but nothing else. Understandably she’s perturbed but her family manage to convince her it’s not her, just someone who looks like her. But then Zoe sees another picture of a woman who she knows was the victim of a crime, and from there we follow events as they escalate and the true scale of crimes against women becomes clear. We also follow the story of PC Kelly Swift, back in uniform after a disgrace in her career. Can she redeem herself and at the same time find the culprit? This is a fabulous read and a great idea for a story line. I’m surprised I didn’t have nightmares as it’s really quite unsettling. You can tell Mackintosh is so familiar with police procedure as she writes about it with ease. She’s also very good at the red herring. It’s a very relevant story, with the prevalence of the internet in today’s society and makes you realise how careful you have to be. It can be hard to follow up a very successful first novel but this is a triumph and I hope that Clare Mackintosh continues to produce other books of this calibre. I See You was published by Sphere on 28th July 2016.